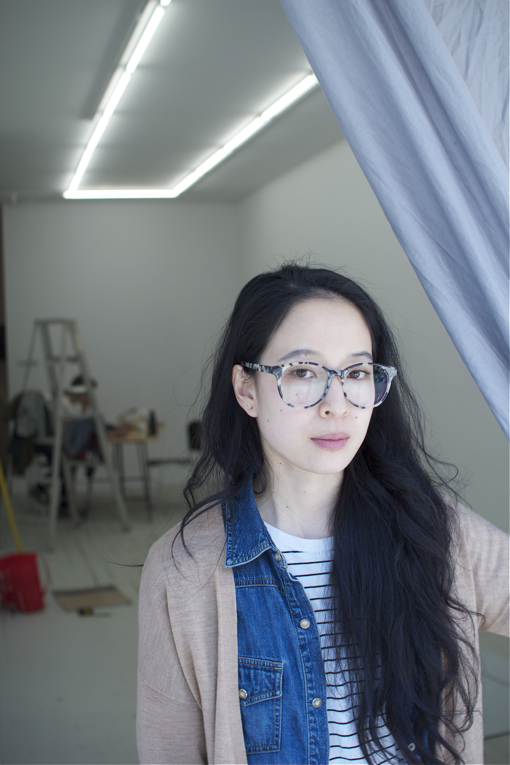 Laurie Kang's exhibition opens tomorrow, April 11th at ESP. We visited her over the weekend during installation to discuss her process and intent. As a photo-based artist, Kang's medium arbitrarily captures a moment in time, however for this exhibition she has bypassed this rule using site-specific installation. Working with a package of Ilford Multigrade IV RC Deluxe silver halide photo paper, Kang ruins the paper for its intended purpose by exposing it to the normal light of a room and then dipping it in fixative. The 50 sheets will be hung the day of the exhibition, their nature changing as they develop and darken during the show. The abstract results of this dip are sublimely beautiful, but this is not the point. The work is making itself and it is the happenstance of this experiment that is more significant. The work doesn't exist in one final fixed state, it is reinvented and contextualized through documentation and interpretation, that then becomes an extension of the work itself. Kang does not seek to enforce meanings on others but rather allows the viewer to remain subjective and open to questioning. By requesting Lucas Soi to write a formal exhibition essay (read here), she allows her intuitive process to be genuine, unhampered by end analysis. A Toronto-based art+design project that celebrates the beautiful, interesting, and dynamic people, places, ideas and objects we encounter in our daily lives.